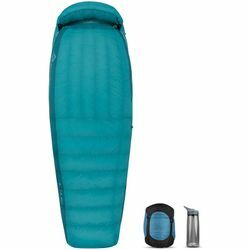 Sea to Summit Altitude AtI 25 Sleeping Bag. Incredibly versatile, the Altitude™ women’s down sleeping bag is snug and cozy when it’s cold outside, cool and ventilated when the weather warms, shaped to match your natural sleeping position for comfort anytime, and light enough to carry anywhere. It could just be the perfect sleeping bag for women adventurers. IS THIS WOMEN'S DOWN SLEEPING BAG…? Warm enough for shoulder seasons? Yes. The high-lofting down, cozy hood and draft collar, and extra Thermolite® insulation in the foot box provide the warmth you need for cold weather. Choose the 15°F model and pair it with a Women's Comfort Light Insulated. Really cool in summer temperatures? Yes. The Free-flow zipper system means separate zippers on your left and right side and in the foot box. Open them for ventilation or turn the Altitude into a fully-flat comforter. Able to be zip together with another sleeping bag? The main side zipper can be zipped to many Sea to Summit Unisex sleeping bags – Regular and Long bags have the same side zipper length.